Kambri is due to open to the public tomorrow (7 February). The building names have not been officially announced, but Observer understands the teaching building and student centre are named after Marie Reay and Di Riddell respectively. Both major buildings appear to be named after women. Diversity was a priority for the University when it came to naming parts of the new precinct. Then-Deputy Vice Chancellor (Academic) Marnie Hughes-Warrington noted in 2017 that the existing names for buildings and streets on campus were “very white and male”. The teaching and learning building seems to be called the Marie Reay Teaching Centre. This is visible on the side of the building. Reay was a major figure in Australian anthropology, and was particularly renowned for her work in the Kuma, Papua New Guinea. She was a member of faculty at ANU for 29 years, and was an active early member of the Australian Anthropology Society. A prize in her honor is currently awarded to PhD students in the Department of Anthropology to assist with fieldwork costs. A public vote helped to determine the building’s name. The student services building is called the Di Riddell Student Centre. This information is available on the Kambri website. Di Riddell was the Administrative Secretary of the Student Association from 1965 until 1990. She was then Manager of the ANU Arts Centre until 1995, later serving as Membership Secretary of the ANU Emeritus Faculty. 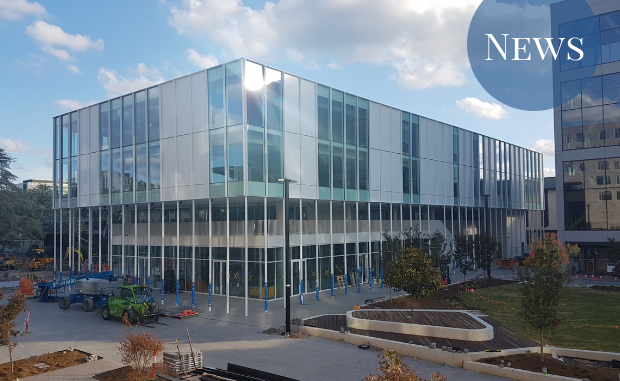 The Student Centre will be home to Griffin Hall; the Academic Skills and Learning Centre; Admissions; the Woroni, ANUSA, and PARSA offices; and various other services. However, work is not yet completed on the building, and it appears that a number of the planned services will not be moving in until March. The University appears to be working down to the wire to meet the planned opening deadline. Construction workers have been working every day of the week, and some worked past 7pm today. A Lendlease spokesperson had previously assured Observer that the whole project would be completed by 1 February. ANU had also said it planned to announce the building and street names progressively, and that all would be announced by the end of 2018. It appears the plan now is to announce the names at the Kambri Concert grand opening event on 11 February – after the precinct has already opened to the public. ANUSA and PARSA did not respond to a request for comment before time of publication. The University referred Observer to the Kambri Concert and grand opening on 11 February.